Lunches feature produce from local, organic producers like: Riverhill Farm, Gregâs Organics, Johansen Ranch, Indian Springs Organics, Wild River Organics, and JSM Organics. October has arrived. The first day of school is a distant memory. As the days get shorter and the leaves begin to turn, we seasonal eaters are busy eating the last of the hot weather crops. Once ubiquitous, zucchini is now a scarce commodity. At the Food Love Farm, cool nights have already brought a chilling frost to the fields, several times over. Soon, we will feast on bright orange winter squash, tender collard greens and sweet broccoli. Moving toward the season of storage foods, we squirrel away the last tomatoes and green beans. Anyone with a home garden has noticed the plants have slowed way down — despite warm days — the cool nights and lack of light are taking their toll. Plants are drying down and making seed; cover crop is going in. Farmers can see the light at the end of the tunnel. There’s still plenty of work to do before winter sets in, but the pace has slowed and the end of the season is in sight. So what better way to celebrate the last of the summer bounty than by tasting sweet, fresh lunchbox peppers? Oh peppers — so crunchy and delicious. What a treat for 7,000 local students to enjoy for October’s Harvest of the Month. Not only did these peppers get sampled in 21 elementary and middle schools, but they were also munched on in four local high schools and featured in the Foothills Fresh school lunch program in meals such as a southwest salad, pasta primavera alfredo and a Harvest of the Month chicken fajita wrap. Launched this school year by Nevada Joint Union High School District, Foothills Fresh serves over 300 lunches a day at Deer Creek Elementary and Seven Hills Middle School. Lunches feature whole foods and produce from local, organic producers like: Riverhill Farm, Greg’s Organics, Johansen Ranch, Indian Springs Organics, Wild River Organics and JSM Organics. As a result, hundreds of students are fed from local and regional farms, supporting our community based food economy. Foothills Fresh has increased school lunch participation and garnered enthusiasm from students, parents and staff. 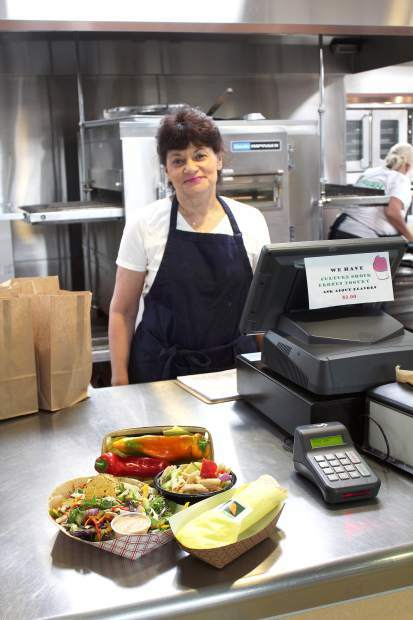 One Seven Hills parent wrote, “The new school lunch program has changed our lives. Not only are my kids enjoying healthy, delicious meals, but we don’t have to be bothered with the inconvenience of making them. Lunch is a critical part of a student’s success and proper nutrition improves academic performance and increases student attendance. By providing a nutritious school lunch, our schools are creating a better learning environment and a healthier community. Foothills Fresh not only supports students nutritionally and academically, it creates an equitable learning environment for students from food insecure homes. Each month, lunches in this program will showcase the Harvest of the Month featured item. To learn more about Foothills Fresh, Harvest of the Month and Farm to School — visit sierraharvest.org or join a lunch at a participating school.